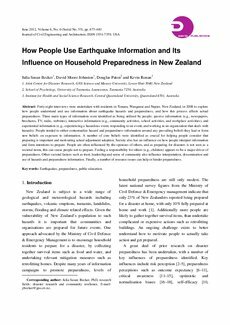 Abstract: Forty-eight interviews were undertaken with residents in Timaru, Wanganui and Napier, New Zealand, in 2008 to explore how people understand and use information about earthquake hazards and preparedness, and how this process affects actual preparedness. Three main types of information were identified as being utilized by people: passive information (e.g., newspapers, brochures, TV, radio, websites), interactive information (e.g., community activities, school activities, and workplace activities), and experiential information (e.g., experiencing a hazardous event, responding to an event, and working in an organization that deals with hazards). People tended to either contextualize hazard and preparedness information around any prevailing beliefs they had or form new beliefs on exposure to information. A number of core beliefs were identified as crucial for helping people consider that preparing is important and motivating actual adjustment adoption. Society also has an influence on how people interpret information and form intentions to prepare. People are often influenced by the opinions of others, and as preparing for disasters is not seen as a societal norm, this can cause people not to prepare. Feeling a responsibility for others (e.g., children) appears to be a major driver of preparedness. Other societal factors such as trust, leadership and sense of community also influence interpretation, dissemination and use of hazards and preparedness information. Finally, a number of resource issues can help or hinder preparedness.